Gavi has become seriously popular recently. Maybe it’s the clean fresh style so ‘typical’ of Italian white wine, maybe it’s that it’s easy to remember and pronounce. 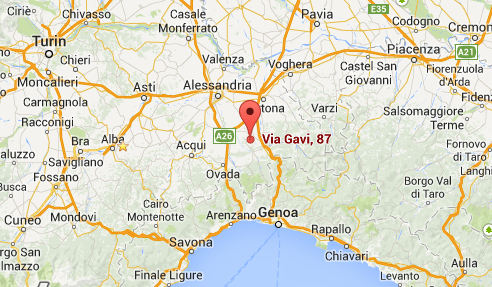 It comes from the ‘armpit’ just north of Genoa, where the Italian peninsula joins the main European landmass. We once imported one of the wines of Tenuta la Marchesa back in 2006, but must have been ahead of the curve – but when we hunted this year it was again this estate which stood out – even if the name of the better cuvée has mysteriously changed from black (‘Etichetta Nera’) to gold. A beautiful 18th Century villa named after the noble bride it was built for – La Marchesa – set among 58ha of vines, making some lovely wines from the local Cortese grape variety. Cool fermentation and a very low sulphur régime yielding wines as light as a feather, crisp and so very clean and with nicely sensible alcohol levels (both under 12%). The lighter of the two Gavis (11.5%), bright, crisp, with hints of citrus fruit. The Gold Label (which as you can see has very little gold on it in reality) spends six months ageing in stainless steel on its lees to pick up a touch more zip, a wafer more weight, and a faint hint of smoke and spice. Still very light and crisp and still just 12%. Great aperitif or with some light healthy-feeling supper. Try them both in this £150 mixed dozen or make up your own mixed case from our Italian white wine selection. and take advantage of our ‘case price discount‘.